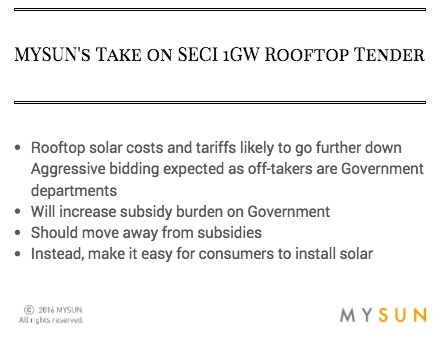 In a major move to push the adaptation of rooftop solar market and march towards the Solar Mission target of 40 GW by 2022, Solar Energy Corporation of India Limited (SECI) has floated a Request for Service (RfS) for implementing 1000 MW grid connected rooftop Solar PV systems for pre-identified central government owned buildings. The tender includes both CAPEX and RESCO models and invites bids from solar installers and developers from across all the states and Union Territories in India. This is by far the largest rooftop tender we have seen in India. 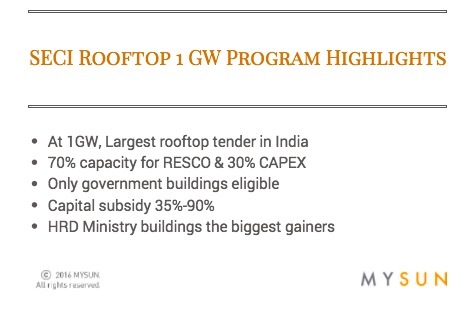 The news comes on the back of the 500 MW SECI rooftop tender that is offering a subsidy of up to 30% - 70% for residential, institutional and social customers for a limited period. Of the 500 MW on auction, 432 MW was awarded to 122 developers. 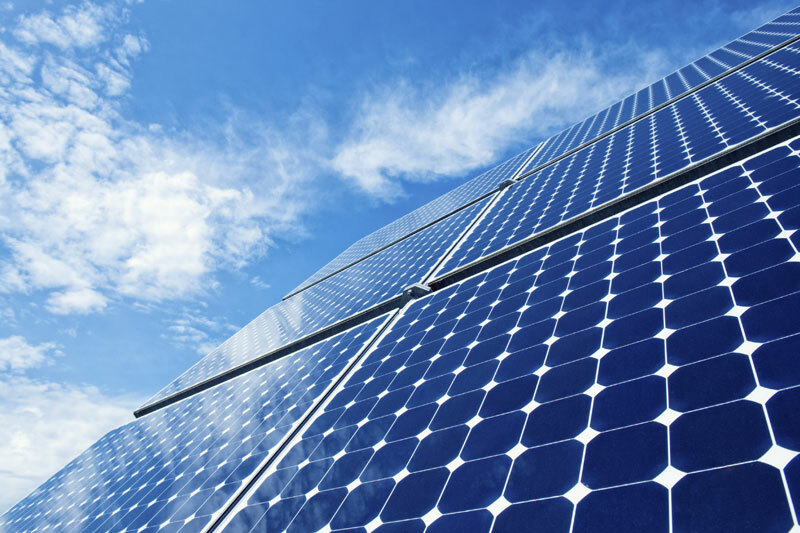 You can read more about the 500 MW rooftop tender here. Out of the 1000 MW, a capacity of 700 MW has been kept aside for the RESCO ownership model (also known as OPEX), where the developers will both, finance and own the solar system and in the process sell power to the government departments at a fixed cost as per a 25 year long PPA. The remaining 300MW has been allocated towards the CAPEX ownership model where the department or the building will purchase and setup the units on their own rooftops. The statewide bidding for the tender will see the bidders trying to match the lowest bid in their respective states. It is mandated that the winning bidders will sign the Power Purchase Agreements (PPA) and the Engineering Procurement Contracts (EPC) within six months and complete the construction, making the plant operational in 15 months time from the date they are awarded the contract. SECI to its credit has already identified suitable rooftops for the program, with over 70% of the capacity being kept aside for the Ministry of Human Resources and Development. This would imply that maximum of the systems will be installed on educational and training institutes. Gujarat is expected to be a home to 267 MW of the capacity, with Uttar Pradesh, Maharashtra, Delhi and Telangana providing a strong push too. 1GW addition to the solar rooftop market is a great start to 2017 and really sets the stage for more such projects for the year. Going by the last 500 MW tender, we expect the tariffs and price of the solar system to get even more competitive. This is primarily on three accounts - one, the module prices are expected to be low in the first half of the year and second, the interest rates are on a downward trajectory and third, the capital subsidy ranging between 35% - 90% earmarked for these projects. The largest factor will be the perceived offtaker risk. Since the offtakers, in this case, are government departments, the developers are expected to be a bit more aggressive while bidding. The tender allows 15 months from the award of the contract to complete project execution in comparison to only 12 months in the 500 MW tender. This is a welcome step since it will allow the installers and developers more time to better plan and execute the projects. However, unlike the 500 MW tender, the bidders who win in 1GW tender will not get full payments up front and the incentives will be released stepwise as the developer meets the timelines and targets. More installations will add more confidence and faith into consumers when it comes to trusting rooftop solar. But for India to reach closer to its 40GW target, the government should not just rely on such tenders as most of these are subsidy based projects which mean there is a huge cost to the exchequer. We strongly believe that the government of India should put more focus on making buying and installation of solar systems simpler for consumers. That will have a spiraling effect on the entire rooftop solar market across consumer categories and will surely help India achieve its targets under the National Solar Mission.